And The Most Memorable 2015 Sports Moment In Chattanooga Is . . .? Players hold up the winner's trophy. I am certain others have a different take on this selection. Of course, others are free to offer their opinion and here's mine: the top story was the Lookouts winning the Southern League Championship. I admit to a bias since I have been a Lookouts' fan since we moved to this area in 1979 and, because I have been the reporter for the Chattanooga Lookouts since 2000. After serving as the Los Angeles Dodgers Double-A affiliate for six summers, the Lookouts signed on with the Minnesota Twins. From the beginning of the season, the talent was there. Chattanoogans were able to watch Byron Buxton, MLB's top prospect, until he was promoted to the Major League team in June, as well Miguel Sano, MLB's No. 10 top prospect, before he moved to the big leagues in early July. The team also lost its top pitching prospect, Jose Berrios, who was promoted to Triple-A Rochester after the first half. Not surprisingly with all that talent, the Lookouts won the first half to qualify for the Southern League championship series at the end of the season. But without that same talent, winning even the North Division crown was a tall task. But the Lookouts won their division and then upset Biloxi to win the SL title. Guy Curtwright, my friend and colleague, was on hand for final out when the Lookouts captured the 2015 Southern League Championship. Below is his article, verbatim, from MiLB.com (Sept. 22, 2015). 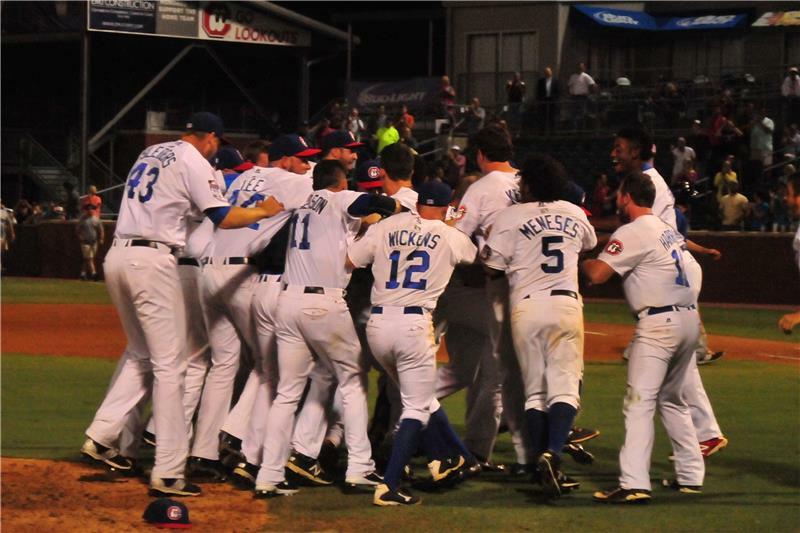 Jason Wheeler had never made a relief appearance before in the Minor Leagues, but there he was being mobbed on the mound as the Chattanooga Lookouts began the celebration of their first Southern League title since 1988. "What a cool feeling with everyone jumping on you," said the 6-foot-6, 255-pound left-hander. "I'm a pretty big guy, so I didn't go down. You don't want to be under a bunch of cleats." Wheeler, who won Game 2 on the road, finished off Biloxi with four innings out of the bullpen as Double-A Chattanooga took the Southern League Championship Series with a 4-0 victory in Game 5 on Monday night. The Twins' No. 25 prospect was named the Most Valuable Player after limiting the Shuckers to a run on four hits over 11 innings in two Finals appearances. Starting right-hander D.J. Baxendale stranded seven runners over the first five innings. Wheeler allowed just a hit and a walk to earn the save. He faced the minimum 12 batters because of two double plays, including one to end the game. Wheeler pitched on just three days' rest after hurling seven innings in Game 2, and manager Doug Mientkiewicz hadn't planned to let him go so long. "But he was throwing strikes, and you don't take someone out when he is pitching like that," the former Major Leaguer said. "I knew I might be pitching, but I definitely didn't expect to finish the game," said Wheeler, an eighth-round pick by the Twins in the 2011 Draft out of Loyola Marymount. "I think the last time I pitched in relief was when I was a freshman or sophomore in college." Wheeler struggled this season with Triple-A Rochester, going 1-7 with a 6.58 ERA, but the 24-year-old from California was 4-3 with a 3.92 ERA in the regular season with Chattanooga before allowing just two runs over 17 innings in three postseason outings. To score the championship, they had to go through Southern League Pitcher of the Year Jorge Lopez, the Brewers' No. 8 prospect, in the final game. Lopez, who had been 2-0 with a 0.66 ERA in the postseason after finishing the regular season 12-5 with a 2.26 ERA, wasn't able to shut down the Lookouts like he had in the Finals opener. The right-hander allowed two runs in the second inning and then a homer to No. 6 Twins prospect Max Kepler in the third before getting the hook after 61 pitches. Kepler, the Southern League's Most Valuable Player, had just three hits in the Championship Series, but all were home runs. "To beat a team as good as Biloxi, we had to be on the top of our game. Tonight, we were," said Mientkiewicz, who managed many of his Chattanooga players to the Florida State League title at Class A Advanced Fort Myers last year. The Lookouts won the first half in the North Division with a team that included top prospects Byron Buxton and Miguel Sano. They finished fourth in the second half, but ended up winning it all in their first year as a Twins affiliate. "The guys believed we were still going to win no matter who they had and they did," Mientkiewicz said. "They just kept grinding. A lot of times it wasn't pretty, but they got the job done." Biloxi didn't score over the last 12 innings of the series, going 0-for-6 with runners in scoring position in Game 5 after a 1-for-7 showing in Game 4. Baxendale, who won the deciding game for Fort Myers last year, had allowed five runs over five innings during the Game 1 loss. But he pitched around four hits and three walks this time, getting two of his three strikeouts with the bases loaded and no outs in the second inning. After the Shuckers couldn't cash in, the Lookouts went ahead with two runs in the bottom of the frame. Third baseman Heiker Meneses tripled and catcher Stuart Turner doubled him, then scored on a single by center fielder Shannon Wilkerson. MLB.com's No. 99 prospect Kepler then connected for a long homer to right field on a 1-0 fastball from Lopez in the third. The distance was put at 430 feet with an exit velocity of 111 mph. Lopez's worst start of the season came against the Lookouts on May 27, when he allowed six earned runs over four innings. After dominating in the opener, he allowed three runs on five hits over three innings in the closer. Ortega followed Lopez and kept it at a three-run game until the seventh, when Turner walked and scored on a double by left fielder Stephen Wickens. It was just the second time in 11 years that a team from the North Division claimed the title and the Lookouts fans in the crowd of 2,275 at AT&T field celebrated loudly with their team. As a Dodgers affiliate, Chattanooga was swept by Jacksonville last year. 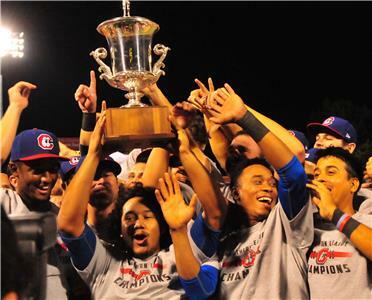 The Lookouts' only previous title was as a first-year Reds' affiliate 27 years ago. They had lost in the Championship Series four times. Despite the loss, it was a very memorable first season for Biloxi. The Shuckers played their first 54 games on the road while MGM Park was being completed and still won the first half in the South Division. They finished with a league-best 78-59 record in the regular season. "Shirts, shirts, shirts," yelled Lookouts players as they prepared to put on their championship souvenirs before heading to the clubhouse for a more raucous celebration. "It's great to be part of this," Wheeler said. "I was with Fort Myers last year, but not at the end of the season when the team won that championship. Now I finally get to celebrate with a lot of those guys. Players mob Jason Wheeler after the third out of the final game.